This leftover roast turkey frittata only takes a few minutes to make but tastes great and is a brilliant way of using up post Christmas or Thanksgiving leftover roast turkey. Why should I make leftover roast turkey frittata? How do I Make Leftover Roast Turkey Frittata? How long will a leftover roast turkey frittata keep? 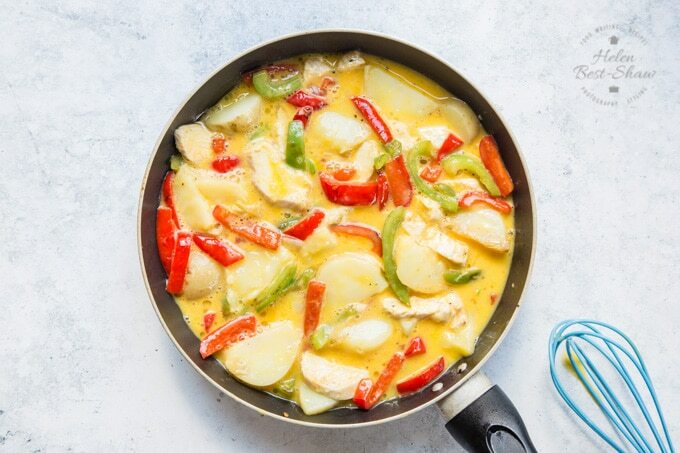 How can I adapt the Turkey Frittata Recipe? Can I freeze Leftover Turkey Frittata? One word: flavour! This is a really rich and delicious recipe; leftover roast turkey frittata is a hugely tasty way of using up leftover roast turkey; far, far nicer than just eating it cold. 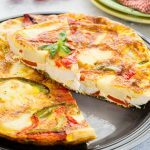 This recipe is more of an Italian-style frittata as it includes both red and green peppers, rather than a Spanish tortilla that traditionally would only include onion, potatoes and egg. It’s also easy to make, and a great way of feeding four people with only 170g/6oz of turkey. While this recipe is perfect for Christmas or Thanksgiving leftovers, it’s not just for the holidays it’s also great throughout the year. 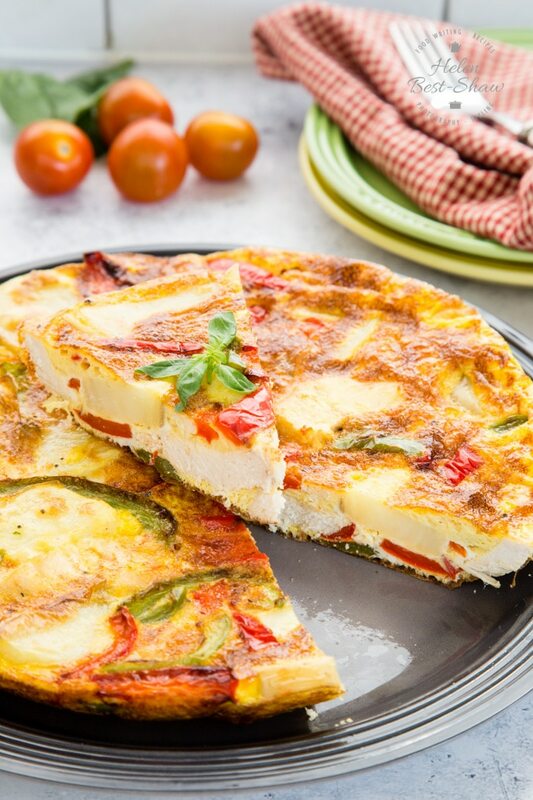 Frittatas are perfect picnic food; just let it cool, cut into slices and pop into a plastic box. Unlike sandwiches, it doesn’t fall apart in transit or as you’re trying to eat it – perfect for a car meal when travelling to see family and friends during the holidays. It’s also not necessary to wait for some leftovers; you can easily cook a turkey breast fillet, or diced turkey breast meat, and follow the rest of the recipe from there. Second, whisk the eggs briefly. 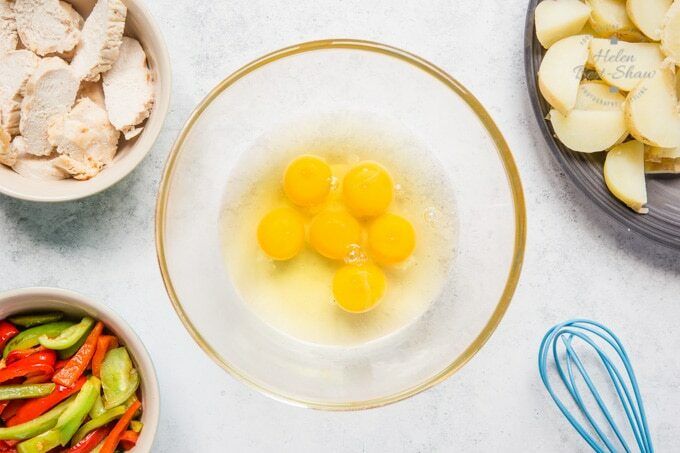 Just enough to break the yolks and mix them into the white. Third, add the other ingredients: turkey, potato, and peppers. Fourth, gently mix all together so as not to break up the potatoes, and season with salt and pepper. Fifth, Pour the mixture into a non-stick frying pan, you many need to gently press down on the filling so it gets covered with the egg mixture, and cook on a low heat for a few minutes. As it cooks, switch on your grill (or broiler). 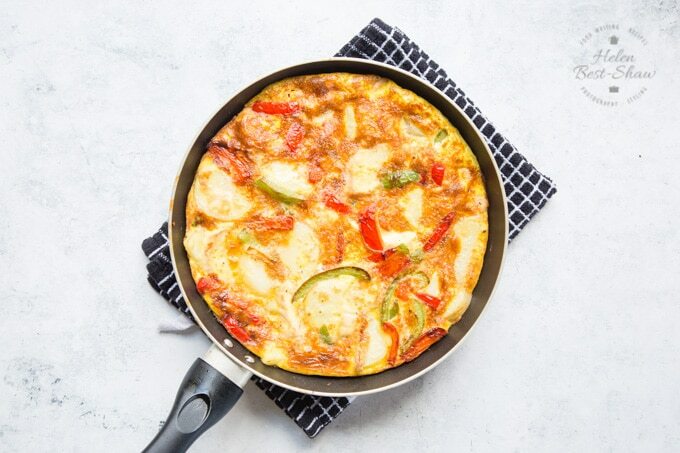 Sixth, When the bottom and sides of the frittata is cooked, and golden coloured – you can check by gently pushing it away from the sides with a spatula – but the top is still liquid, it’s ready to go under the grill or broiler. Seventh, place the frying pan under the grill / broiler to cook the top; as it cooks it will puff up. Keep an eye on it as you don’t want it to overcook or burn. It’s done when the egg is just cooked all the way through – test with a knife. 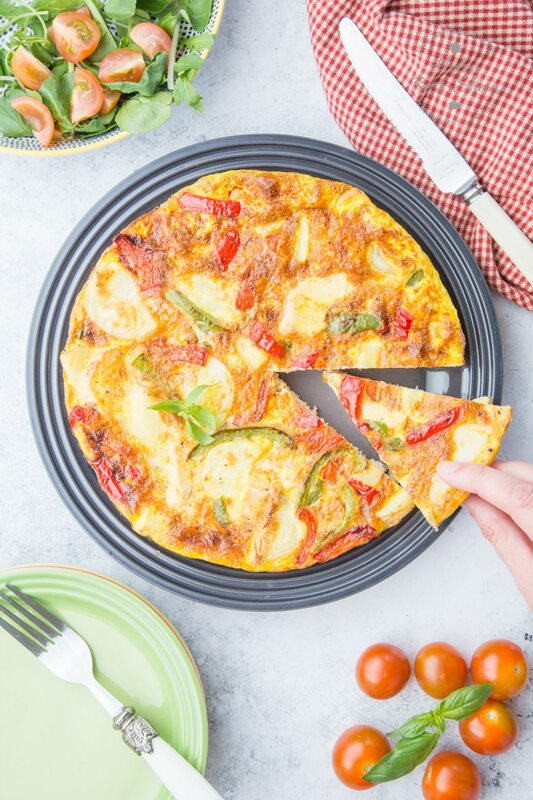 Keep a very careful eye on the frittata when it is under the grill or broiler! Most grills have hot spots and you will need to move the pan around for it to cook evenly. If your pan has a metal handle it will get hot. DO NOT forget and grab it. Yes I have done this and was quite badly burnt. 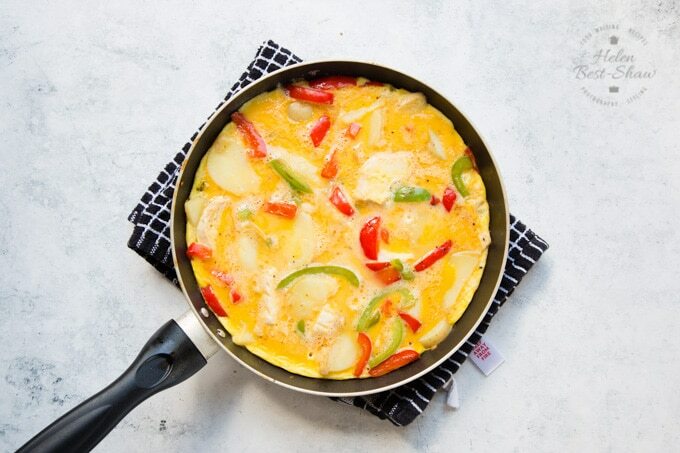 Finally, run a spatula round the edge of the pan, flip the frittata out onto a board, then flip back onto a plate and enjoy. 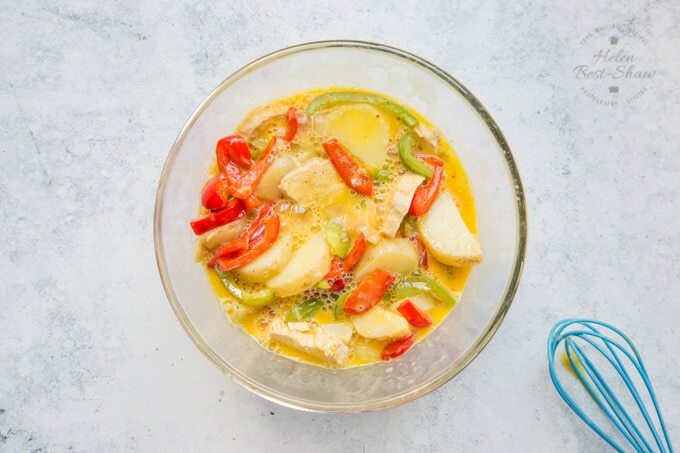 This turkey frittata can be kept for 2 days in the fridge in a sealed container. Enjoy chilled from the fridge or allow it to come to room temperature before eating. Reheat in the microwave for 30 seconds at medium power. 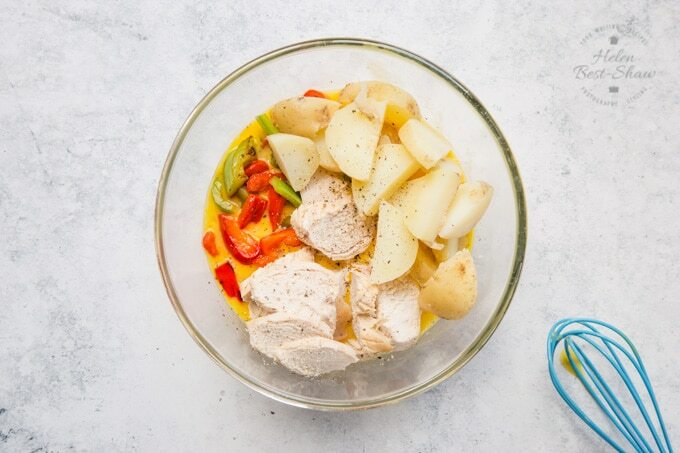 There are SO many adaptions for this recipe, use different vegetables – any you cooked to serve with the original roast turkey would be be delicious, including sliced leftover roast potatoes. Add some grated cheese for extra flavour and for a low carb version leave out the potatoes and add in extra turkey. I really don’t recommend freezing a frittata. Its OK but they can come out a little soggy. Frittatas are so quick and easy to make there really is not need to freeze them – make them using leftover turkey which has been frozen! You may want to try my Mushroom Frittata as well! If you try this Leftover Roast Turkey Frittata please tag #FussFreeFlavours on Instagram or Twitter. It is amazing for me when for me when you make one of my recipes and I really do love to see them. You can also share it on my Facebook page. Please pin this recipe to Pinterest too! Thanks for reading Fuss Free Flavours! Frittatas are quick and easy to make. This versions uses leftover turkey; it's ideal for using up any leftovers you may have. Ideal for picnics, travel and packed lunches. Easily adaptable. Add the olive oil to a deep 25cm / 10” non stick omelette pan and gently fry the peppers and onion until soft and starting to turn brown. Turn out onto a plate. Meanwhile in a large bowl, briefly whisk the eggs. Add turkey, potatoes and cooked peppers to the egg. Season with salt and pepper. Mix together gently so as not to break up the potato slices. Transfer the mixture to the frying pan. At the same time that you start to cook the frittata on the hob (burner), turn on the grill (or broiler). Cook the frittata on the hob or burner, on a medium low heat for about 10 minutes, until the bottom has started to colour (you can pull it away from the sides of the pan with a spatula), but the top is still liquid. Transfer the pan under the grill/ broiler for a few minutes until the top of the frittata is golden brown and has puffed up. Allow to cool for a few minutes, flip out onto a plate, and serve with some green salad.